Tamás Varga was born in Budapest in 1969 and began studying the cello at age of seven. In 1992 he completed a degree with honors at the Franz Liszt Academy of Music, where his teachers included László Mező, Ferenc Rados and György Kurtág. Mr. Varga was also highly influenced by such artists as Miklós Perényi, Menahem Pressler and Uzi Wiesel, the last of whom accepted him as a scholarship student at the Rubin Academy in Tel Aviv. 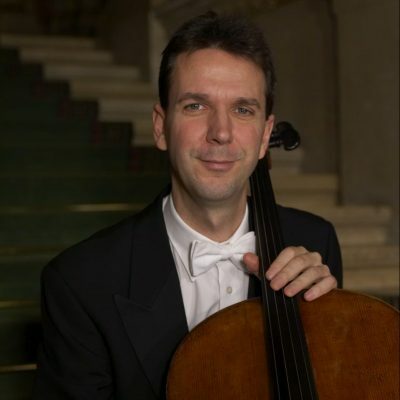 Tamás Varga is Principal Cellist of the Vienna Philharmonic Orchestra (VPO) as well as the Vienna State Opera. A regular soloist with the VPO, he performed under Giuseppe Sinopoli, Zubin Mehta, Seiji Ozawa, Michael Tilson-Thomas, Christoph Eschenbach, Adam Fischer, Andris Nelsons. In addition to his 2003 BBC Proms debut at London’s Royal Albert Hall, Mr. Varga has appeared in numerous solo and chamber music engagements across Europe, USA, Canada, South Africa, Australia and Asia. Mr. Varga is also an enthusiastic chamber musician. As a member of the Ensemble Wiener Collage, the Breughel Ensemble and the Wiener Kammerensemble, he regularly appears in the Wiener Konzerthaus and Salzburg Festival, among other European venues. He has collaborated with such artists as Hildegard Behrens, Marjana Lipovsek, Ferenc Bognár, Philippe Entremont, Zoltán Kocsis, Tamás Vásáry, Karl Leister, Peter Schmidl, Wolfgang Schulz and the Bartók-Quartett. Tamás Varga particularly enjoys playing music on original instruments, and has performed several cello concertos with the Orfeo Orchestra Budapest. He has collaborated for years with Jordi Savall as member of the “Le Concert des Nations”. In 2004 he presented and recorded the complete Bach solo suites, the sixth of which he performed on a five stringed Baroque instrument. An avid teacher, Mr. Varga has given master classes in Austria, Germany, Hungary, Italy, Japan, Australia, USA, China as well as in South Africa. He served as a tutor for the Gustav Mahler Youth Orchestra, for the New World Symphony as well as for the YouTube Symphony Orchestra and was teaching at the International Orchestra Institute in Attergau, Austria for several years. In the last years, Tamás Varga has recorded more than 25 CDs for labels such as Camerata Tokyo, Naxos, Hungaroton, King Records and Cavalli Records.